We all overeat at times especially on special occasions, but for binge eaters, overeating is regular and uncontrollable. This is a serious eating disorder in which one frequently consumes large amounts of food. The exact cause of this condition is unknown but biological factors, family history, long term dieting and psychological issues increase one's risk. Binge eating may be comforting for a person for a brief moment and then reality sets back in along with self-loathing. 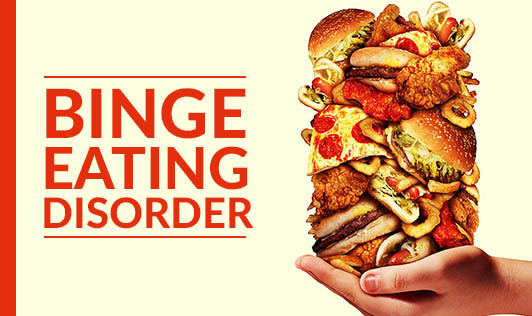 Binge eating disorder leads to obesity and weight gain which only reinforces compulsive eating. Though a binge eater feels embarrassed about his or her appearance, he continues to use food as a way to cope. Thus, it becomes a vicious cycle, eating to feel better, feeling even worse and then turning back to food for comfort. A person with this condition can become an expert at hiding his or her behaviour, making it quite difficult for others to identify the problem. If you have a loved one, and think he has symptoms of binge eating disorder, offer support and help him or her to get help immediately!